We have developed video-assisted thyroidectomy via the axillary approach using the lifting method without carbon dioxide. We created and have used a new equipment in the recent cases. In this study, we presented and verified our method with regard to surgical factors and patients’ complaints after surgery. Method: Our axillary procedure was performed in 35 patients (age 55.7±3.4, Male 6 Female 29). New equipments were used in eight patients of 35 patients. The patient was placed in a supine position with the neck extended and the arm on the tumor side raised over the forehead to expose the axilla. One 40 mm vertical incision was made in the axilla. After the subcutaneous tissue was dissected from the axilla to the neck, the neck and anterior chest skin were lifted up by a new retractor ( Takasago Medical Co. Japan ) with 5mm trocar in new method to make the working space. Flexible scope ( Olympus Co. Japan ) was used through this trocar. Thyroidectomy was performed through the axillary incision using an ultrasonic scalpel mainly. Results: No scars in the neck and the anterior chest were left in all cases. Benign and hemilateral tumors sized to less than 5 cm ( 2.4±0.2 cm ) and micro papillary carcinoma sized to less than 1 cm were operated. The mean duration of operation is 216±50min. in new method, 181±10 min. in previous method. The duration of operation was gradually decreased in both groups. Five complications ( temporary hoarseness 2 cases, skin injury 2, and artery injury 1 ) were experienced in previous method, no complications were demonstrated in new method. Conclusion: New equipments are useful to make the working space. New equipment can be introduced easily in most hospital, because it is not so expensive and easy to treat. 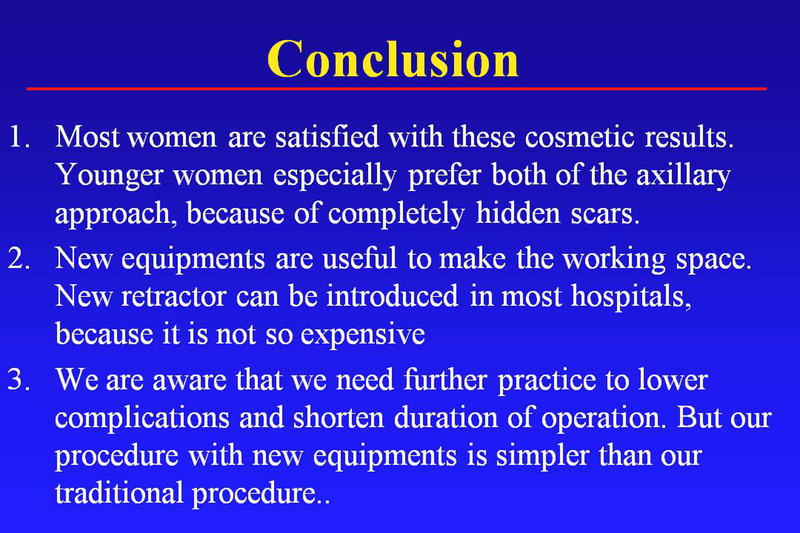 Most of women satisfied cosmetic results in both, young ladies especially prefer to our axillary approach.